It still doesn’t seem real that your gone brother. I still look up pictures of you and read articles about you every once in a while. Every time things get rough at work and I get down, I just think about you and how you would always make things better when ever I was feeling down. You always knew how to cheer people up. It usually ended up with us hitting a mud hole. I know your up there watching our six. Till Valhalla brother. Miss you and love you! In ZAX! Officer Franks, I knew you since we were teenagers, back home. Since your passing I have begun BLET and your sacrifice and heroism is a driving factor for me during this time. You will be missed by many, but until we meet again, we have the watch. God bless you and your family. My condolences to the family and friends of Police Officer Jared William Franks. Losing a loved one is always difficult. Please try to take comfort in Jesus words found at John 5:28, 29 where he said that there would be a resurrection. Just think of the time when you will see your loved ones again, in paradise conditions, here on earth. 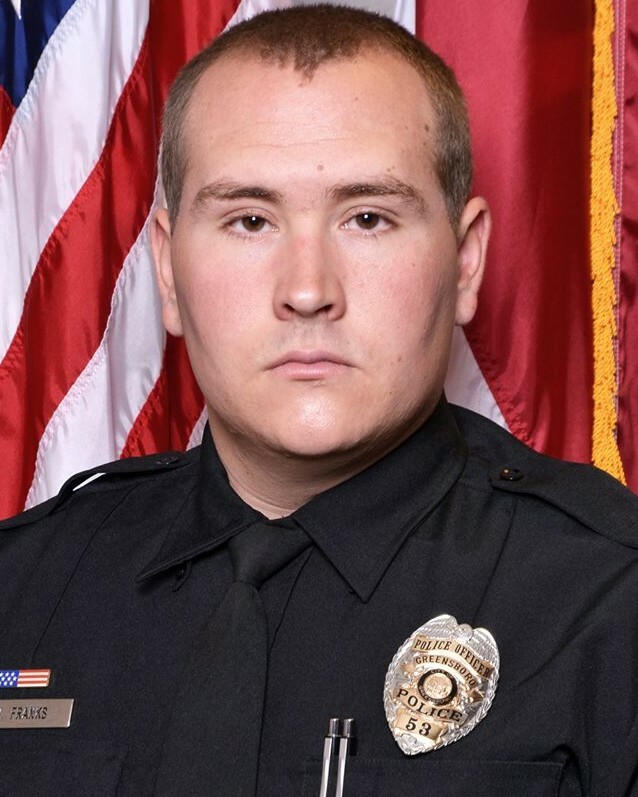 My deepest condolences to the entire family of Officer Jared William Franks, and to his brothers and sisters with the Greensboro Police Department. May Jared's soul forever rest in peace. A police officer should be remembered not by how he died, but how he lived! A great man has gone to secure a safe path for the rest of us to follow. Thank you to you, your family and the Greensboro Police Department. Our country is a little less safe without you. Rest in Peace Brother! May your soul RIP Officer Frank's. Thank you for your service. Condolences to your family and loved ones. May God be with you Officer Franks. It was a privilege and an honor to work with you. Rest easy bud we got the watch now. Thank you for your service and sacrifice. Rest In Peace Officer Franks. Our deepest heartfelt condolences to all of your family, friends, and brothers and sisters at Greensboro Police Department. The men & women of the Abilene Police Department are saddened to learn of the death of Police Officer Jared Franks. We pray comfort & peace for Jared's family, coworkers, & friends, as they grieve his death. We celebrate his life for its sacrifice and service to community. I met you in the county jail. The Greensboro Police Department will miss you. You seemed like a fine officer. My condolences to your family and brother and sister officers. Officer Franks, RIP. Rest in peace Officer Franks. A North Carolina police hero! Officer Franks, So sorry for your life to have been taken, so early into your career. So unfortunate for you to have made the “Ultimate Sacrifice,” but thanks for your service. May GOD bless you, your family and your extended law enforcement family. You will be missed but not forgotten. Rest In Peace Brother!! !